Home / Blog / Colombian Salsa, ¡Por Favor! Salsa is one of the first things that come to mind when you think of Latin America. It originated in the tropical coasts of the Caribbean, Cuba has one of the most known salsa styles and Colombia is proudly home to the city of Cali, the world’s salsa capital. Salsa in Colombia is a big thing, and when we say big we mean massive. Just take a walk around Cali, jump in a taxi in Medellín or go for a night out in Cartagena and all you’ll hear is colorful trumpets and upbeat timbales.Colombian salsa is like no other, but what makes it so? First of all, Colombians have a very unique way to dance salsa: the iconic Cali style. Originated in the vibrant city of Cali and then adopted by pretty much the rest of the country, Salsa Caleña or Cali style is all about how fast your feet can go. Dancers twiddle, turn and reach mind-blowing speeds even making their feet blur. This is what people mean when they say Colombian salsa. This is our fantastic Instructor Lucia, dancing at a bar in Cali. We know, this might be a bit puzzling whether you have had some experience with salsa or not. If you haven’t it might seem impossible at first glance and if you have you’ll notice Colombian salsa is entirely different to what’s commonly danced in NY, Cuba or other major Salsa destinations. Let’s take you around two of our major cities to explore all this “sabrosura”. Now, if want to get more into the pro side of things you should know that one of the trademarks of this style is a bit of acrobacy. Yes, you read us right people, acrobacy. Get down to those front splits because if you’re a girl you’re most likely to be lifted in the air, split, do a somersault and land again to speed-up your feet non-stop. And well, if you’re a guy get ready to lead, it’ll be your responsibility that everything looks smooth #nopresure. How about we travel north? Mountains, sunshine, flowers and a great cup of coffee…. We’ve arrived in Medellín. The city of eternal spring – say summer, gotta hate global warming – also beats and breaths to the rhythm of salsa. The style is a bit different tho. As we said before, Cali style spread to pretty much the rest of Colombia in the past decades and Medellín is no exception. Going for a night out in Medellín you’ll notice that Paisas are a lot more layback when it comes to dancing, also a bit more flirtatious. Essentially, Paisas dance using more basic footwork, there might be one or two kicks here and there and a couple of turns, but in this city, it is more about feeling the music through your body and letting it flow. Women bring attention to their hips using “wavier” movements, some might even play with their hair a little… And well men, they lead smoothly, hold women firmly, but softly and might drink a sip or two of beer in the process. Another interesting thing you’ll notice when going out in Medellín is that for Paisas salsa comes naturally, no one is worried about making the perfect turn or the most intricate footwork. There’s laughter, flirting, sharing. Colombian salsa is very welcoming, we dance with contagious joy, contagious “sabor”. Definitely, what makes the Colombian salsa experience so unique is our “sabor”, our “flavor”. It is hard to put “Sabor” in English terms, but essentially it is that Latino sensuality, joy, color and warmth that translates into every movement. It is true, not every Colombian is a pro like our fabulous Lucía, but man when there’s some salsa playing our “sabor” takes over and from then on it’s unstoppable. We Colombians carry salsa in our blood and this tradition resonates everywhere. From a small “tienda” – sort of a tiny local store, usually located at a random window or garage which sells everything from batteries and lime-flavored chips to cornstarch – to the trendiest venue and yes, even the Metro stations of Medellín. Best idea is to come to experience this yourself. If you haven’t had any contact with salsa, don’t panic, Colombia offers the friendliest environment for you to learn, most of us learned how to dance on the streets at our family parties anyway! No one expects you to be a pro. 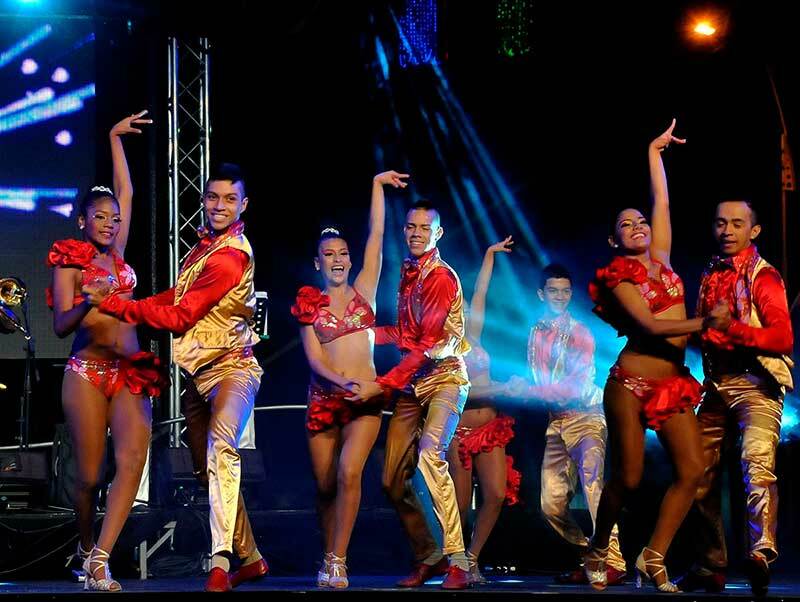 And well if you already know some salsa, this is the perfect opportunity for you to challenge yourself and dive into the mesmerizing Colombian salsa.